Get ready to taste the best shrimp you’ve never tried. I’ve been craving shrimp lately and seafood in general and I decided to work some shrimp (the only seafood my Main Taste Tester will eat) into this week’s dinner menu. I wasn’t sure what I wanted to do with them exactly but I decided grilling them on the barbecue would be the way to go. I threw together a simple marinade and put them in the fridge to soak up all the goodness while I was at work. 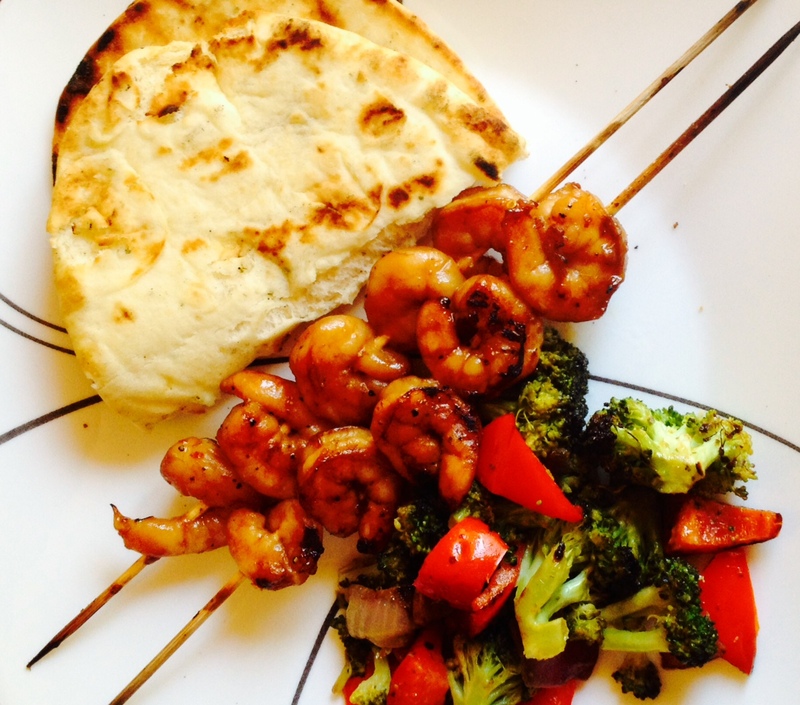 When I came home, I skewered the shrimp and we threw them on the grill with some pesto vegetables (our fave way to get our veggies in; recipe below) and naan bread (are you sick of hearing me talk about naan bread yet?). From the first bite, we were totally amazed by these. They are sweet and spicy and super flavorful and all kinds of other wonderful adjectives. I know that description is pathetic but I lose my eloquence when food is this good. I made 35 shrimp total and my MTT would have eaten them all himself. I had to beg for a skewer for my lunch the next day. Right after supper he actually called his parents to tell them he’d just eaten “the best shrimp of his life”. I thought I’d had the best shrimp of my life in Cancun, but I’m telling you, these might just be better. I never thought I’d see the day. My MTT literally talked about them all night after eating them and I was instructed to double the order next time. I won’t argue. Try these. I’m begging you. They’re the best thing you’ll barbecue all summer. Stir marinade ingredients together in a medium bowl. Add shrimp and cover well with the marinade. Cover bowl and refrigerate at least two hours or overnight. After the shrimp are done marinating, preheat your grill to 325 degrees. While the grill heats up, skewer the shrimp (I did 5 shrimp on each skewer and got 7 skewers total). Reserve the bowl with the leftover marinade. 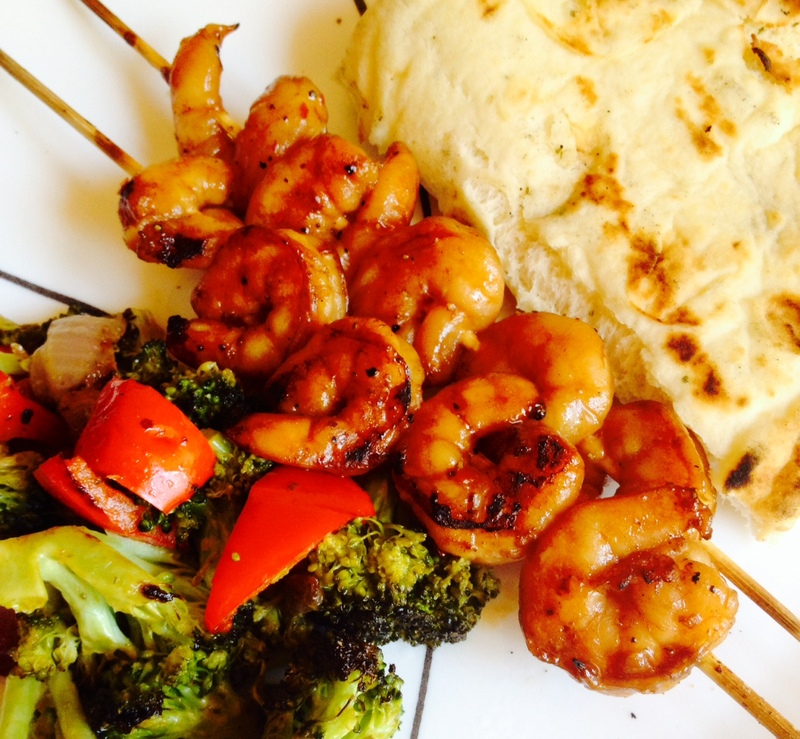 To cook, lay shrimp skewers down on the grill and cook for about 3 minutes. Flip the shrimp skewers and brush them with the leftover marinade. Cook for another three minutes, flip again and brush with the marinade one last time. Cook for another minute or so. Shrimp are done when they turn pink and start to caramelize. Remove from the grill and serve! Preheat your barbecue to 325 degrees. Toss all ingredients together in a 9×13 pan (I used a disposable aluminum one). Put the pan directly on the grill and cook for about 15 minutes, tossing often. If you find the vegetables are sticking to the bottom of the pan, add a little more olive oil. Once the vegetables are tender and start to caramelize, remove from the grill and serve.